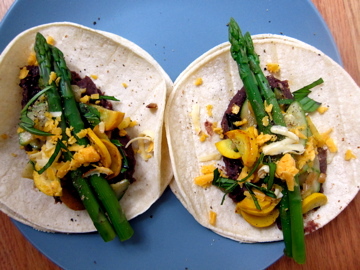 Steamed corn tortillas, refried black beans, garlicky sauteed summer squash, blanched asparagus, fresh basil, cheesy shreds, salt n’ pepper. There’s no better way to enjoy fresh summer vegetables. I was inspired by the produce at the little farmer’s market near my apartment. Not necessarily the traditional accouterment for tacos, but I went with my craving. I’m a sucker for oven-roasted asparagus, but there was no way I was turning on the oven today, not in this 100 degree weather. Instead, I boiled water in a large saucepan, salted the water, dropped the asparagus in for 3 minutes, took them out with tongs, and seasoned them with salt and pepper. All too easy and the result produced the most vibrant green asparagus I ever laid my eyes on. Heavy on the garlic. That was my motto for the summer squash saute. 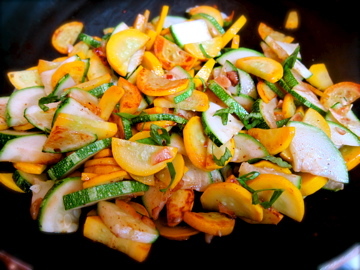 I lightly fried the garlic in just a little oil, then added my thinly sliced squash to the pan, sautéing until browned. The trick is not to move things around too much in the pan. Only stir every 1-2 minutes or so. Basil gets thinly sliced into a chiffonade (just roll the leaves and slice into thin ribbons) and added at the very end of cooking. I purchased Thai basil, which has a more licorice/anise flavor profile versus the sweeter Italian basil. You can use either basil variety interchangeably. I was feeling experimental today so I went with Thai. Talk about fusion! Of course, you could always use cilantro or another herb of your choice in this dish. Steaming tortillas is a cinch in the microwave. Place two tortillas side by side on a large plate. Top with a damp paper towel. Place two more tortillas on top plus one more damp paper towel to cover everything. Heat in the microwave for 1 minute and you’ve got yourself steamed tortillas (enough for 2 servings= 2 corn tortillas per serving). Have you tried refried black beans yet? Tasty town. Out of the can and into a small pan to be heated with a little grated cheese on top. Protein power. Taco assembly involves a hefty helping of beans spread onto a steamed tortilla. 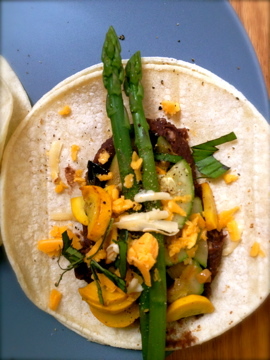 Topped with the summer squash saute, 2 or 3 asparagus spears, some extra grated cheese, and basil. Salt and pepper make my wheels turn. You can add some hot sauce or chili flakes if you wish. Tacos in the summer are a must. 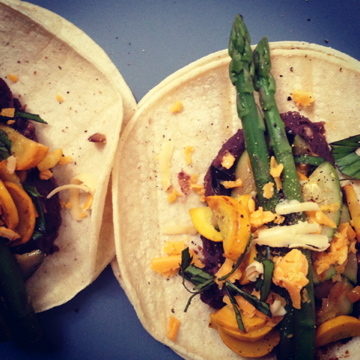 Check out these charred corn and feta tacos that I made last summer. Snap the woody ends off of the asparagus. In a large saucepan, bring water to a boil. Once the water boils, add some salt. Gently drop the asparagus into the water for 3 minutes. 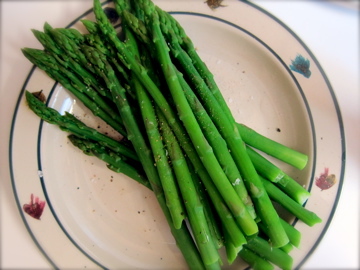 Take the asparagus out of the water with tongs, season with salt and pepper, and set aside. Dump out the excess water. Halve and thinly slice the summer squash. In a pan (you can use the same pan as above so long as you dry it out), heat the oil. Add the garlic and cook for about 1-2 minutes. 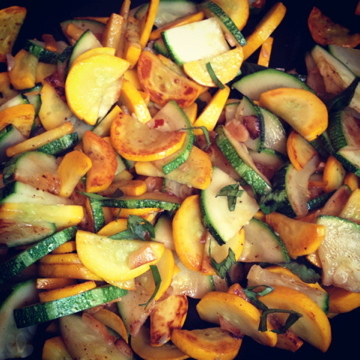 Add the squash and saute until browned. Only stir every 1-2 minutes so that the squash can get nice and golden brown. Add the chili powder and some salt. Roll the basil leaves up and slice them into thin ribbons. 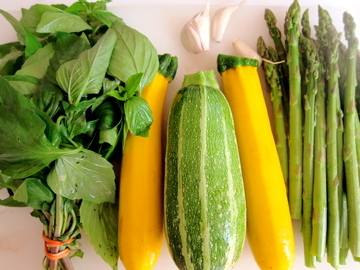 Once the squash is nearly done cooking, stir in the basil leaves and turn off the heat. To prepare the beans, open the can and place the contents into a small saucepan. Heat on low. Add about half of the grated cheese and stir into the beans until melty. To steam the tortillas, place tortillas onto a plate with damp paper towels between each tortilla. Heat in the microwave for 1 minute or until soft and pliable. To assemble the tacos, spread a hefty amount of beans onto a tortilla. Add some squash. Place 2 or 3 asparagus spears on top. Garnish with extra cheese, basil, salt, and pepper. You’ve done well, my friends.